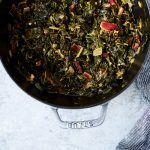 Cast Iron Skillet Crispy Kale is a favorite easy weeknight side dish for us. 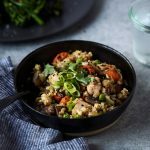 Cast Iron Skillet Crispy Kale is ready in under 10 minutes, under 5 if you are in a rush and don’t care about the crispiness factor. 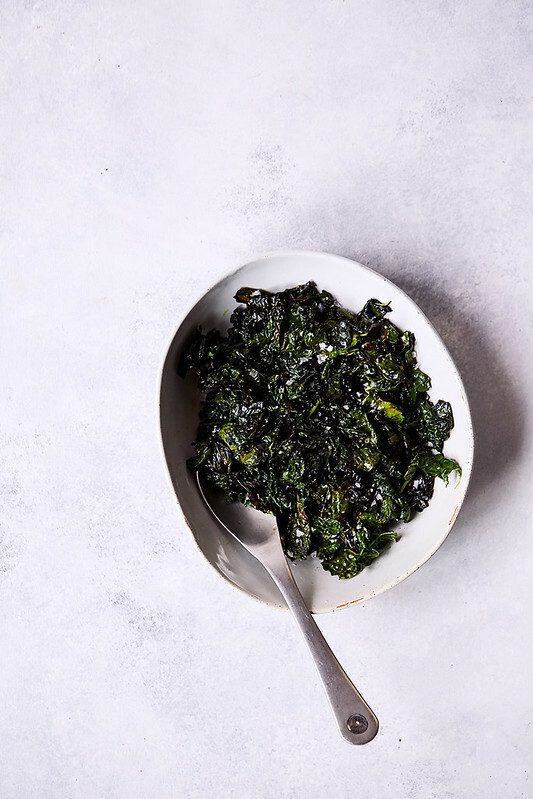 Best part, kale is one of the most nutrient-dense foods on the planet, so this Cast Iron Skillet Crispy Kale tastes great and it’s great for you, too! WIN WIN! 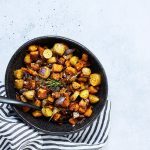 I am all about the simple, easy, weeknight dishes but I especially love nutrient-dense, brain-boosting foods that are easy to prepare and include in the weekly repertoire. One of the world’s most nutrient dense foods, kale is an inexpensive way to load up on important vitamins, minerals and other nutrients. Kale is incredibly rich in Vitamin C (more than 4.5 times what you can find in spinach and 1 cup of raw kale has more vitamins C than a whole orange). Kale is also one of the world’s best sources of Vitamin K, with 1 cup of raw kale containing more than 7 times the recommended daily amount, Vitamin K is an important nutrient involved in blood clotting. Kale is also a great source of B6 and other B Vitamins. Kale like other leafy greens is a rich source of antioxidants, specifically Beta-Cerotene, an antioxidant the body can turn into Vitamin A, along with various polyphenols and flavonoids, including two flavonoids, quercetin and kaempferol known for being heart protective, anti-inflammatory, anti-viral and so much more. Kale actually contains over 45 different flavonoids! WOAH! 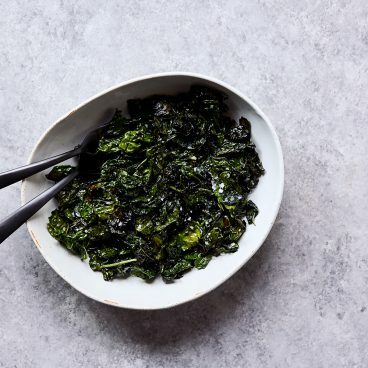 Lutein and zeaxanthin, catenoid antioxidants these are the nutrients that give kale its deep, dark green coloring and they are protective against macular degeneration and cataracts. Kale is also high in many minerals people are often deficient in, some of the minerals found in kale include calcium, magnesium, manganese, potassium, phosphorus, zinc, copper, iron, to name a few. Finally, kale is rich source of chemical called sulforaphane. Sulforaphane is a sulfur-rich chemical that activates a gene pathway called Nrf2, and when this pathway is turned on by consuming sulforaphane rich foods, several important health-promoting mechanisms are accentuated. 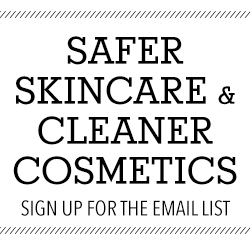 These include powerful anti-aging effects, a reduction in inflammation, enhanced antioxidant protection, and powerful amplification of our ability to detoxify potential damaging chemicals. 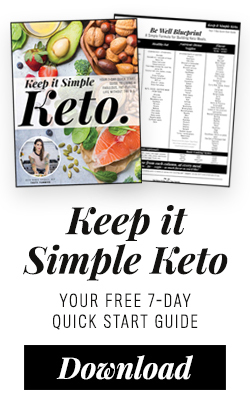 It should be noted, that sulforaphane is most effective when the vegetables are left raw, cooking can destroy the sulforaphane. 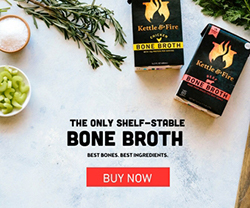 But it’s such a super cool chemical we get from many cruciferous vegetables (it’s insanely abundant in broccoli sprouts), that I wanted to share. 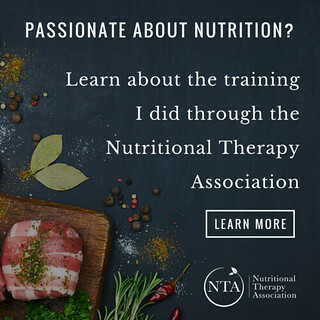 The thing is, I know we like to make fun of food for being a wildly popular superfood that all the crunchy nutrition-focused folks have adopted, but it deserves all of it’s praise. It truly is a super food and I don’t know about you, rather than pureeing it into some smoothie, I would much prefer to taste it, especially coated in a little olive oil, some flaked sea salt and with a nice crispy crunch. 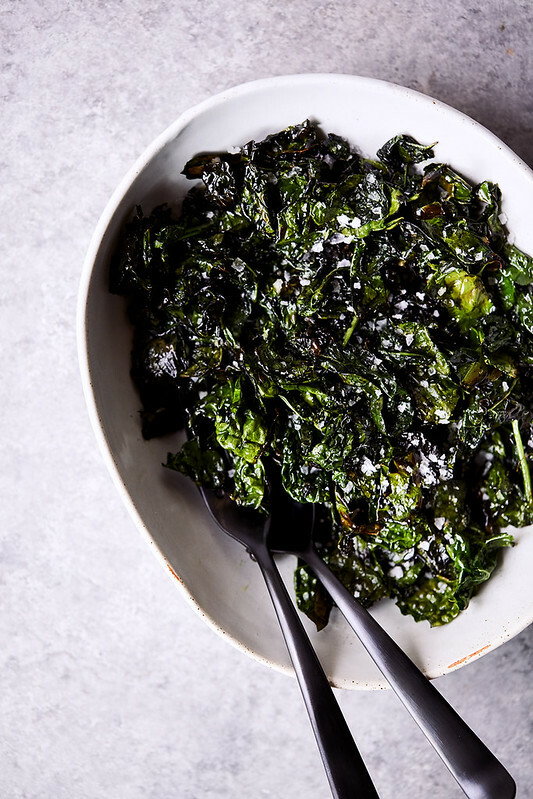 If you ask me, there is no great way to enjoy kale than with this Cast Iron Skillet Crispy Kale. 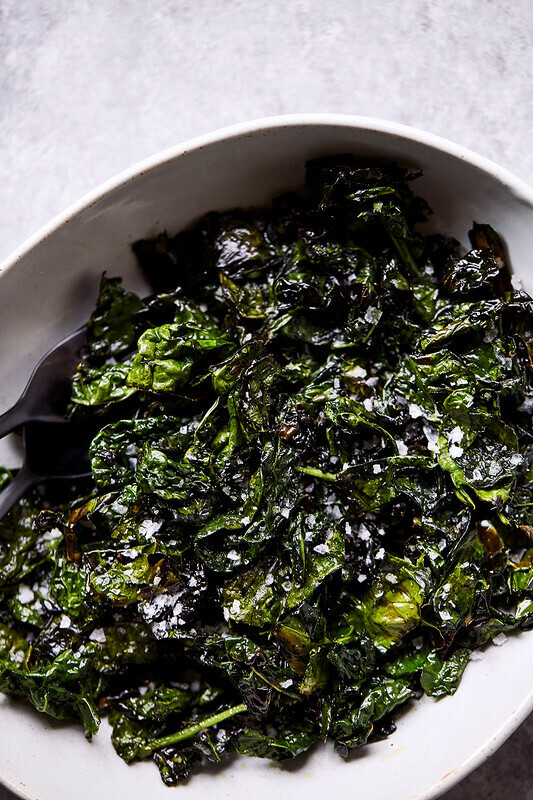 We’ve all had the crispy, crunchy baked kale chips, but they take a bit of time and sometimes they just refuse to get crispy. Plus, I personally love the delicious, delicate taste of the olive oil paired with the crispy kale. And the bonus, the fat helps our body to better absorb and assimilate all of the many nutrients contained within the kale. 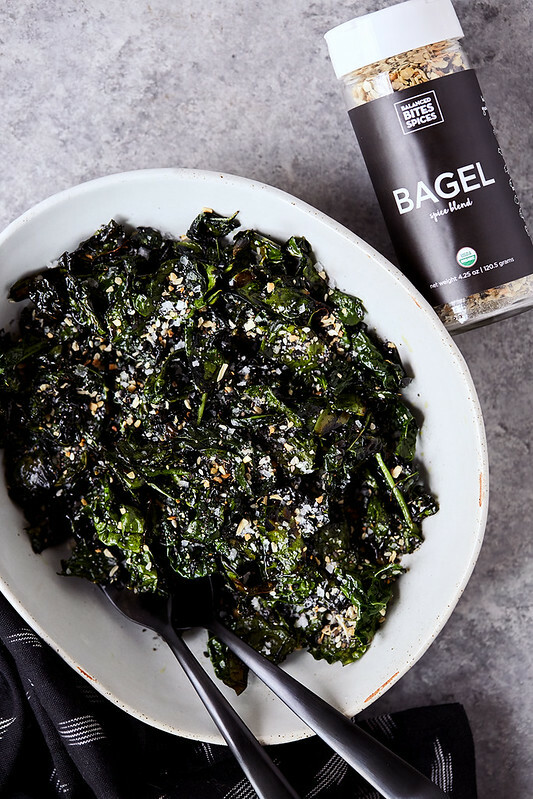 Plus with this Cast Iron Skillet Crispy Kale, you can have fun with flavors, try a little Everything Bagel spice blend, some lemon juice and red pepper flakes, maybe just a little garlic or some coconut aminos and sesame oil, lots of variations. Also try a little bacon fat instead of olive oil BOOM game changer. Strip the leaves of kale from the rib and stem. Roughly tear the leaves, then wash them. Dry the leaves well. If your kale is still wet, it won't get crispy and will spatter when it hits the oil in the pan. Heat a large, heavy (ideally cast iron) pan over high heat. When the pan is hot, add the oil to the pan. Add as much of the kale as will comfortably fit in the pan, without shoving it all in if it's too much, wait to add the rest. Adding the raw kale in batches will ensure it is extra crispy, instead of just steaming and cooking down. Add a generous pinch of salt and black pepper. Use a pair of tongs to turn the kale in the pan to wilt sightly. After about 30 seconds to a minute, when the kale reduces, add more raw kale and continue until all of the kale is in the pan. Don't move it around a ton, to get it really crispy. 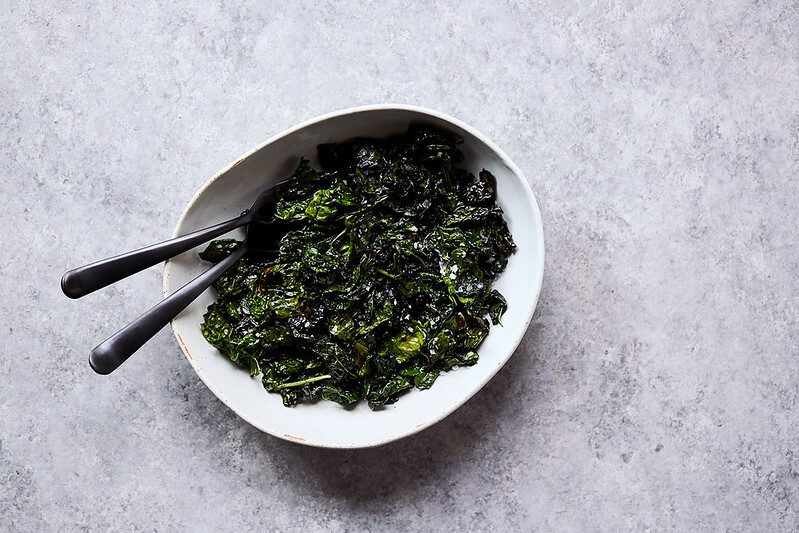 Cook until the kale is tender, with crispy brown patches here and there. 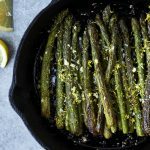 Move the leaves around in the pan with the tongs until they are charred and crisp in places (mostly around the edges) but there are still lots of bright green and tender spots. This should take about 5-8 minutes, or so. Taste and add more salt, if needed. Serve immediately. Add fresh garlic at the end or a squeeze of lemon and a pinch of crushed red pepper flakes, if desired. It's also delicious with a generous sprinkle of Everything Bagel Spice Blend. 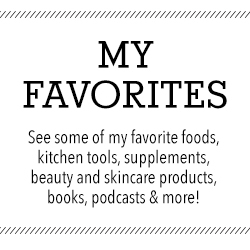 I also LOVE rendered bacon fat, lard or other animal fats, for extra flavor. 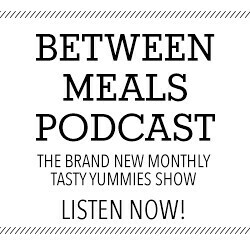 Balanced Bites Bagel Blend is amazing spice blend on your Cast Iron Skillet Crispy Kale!